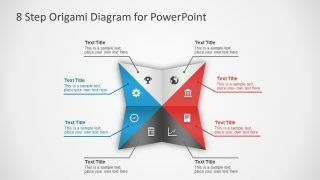 The Free 8 Step Origami Diagram for PowerPoint is a colorful presentation of creative four sides diagram. The PowerPoint free design template of origami-theme has 8 infographic segments. 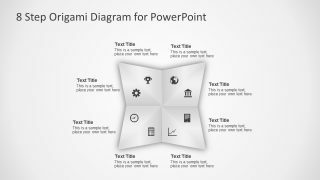 It is a modern and versatile PowerPoint to discuss innovative multi option ideas. The free diagram template contains four sets of two triangle segments each. Whereas, the four sets are differentiable by the pastel color fills. These colors however, are changeable from drawing format menu option of built-in shape fills. Moreover, the users can create custom colors for every section to use according to the theme of main presentation. 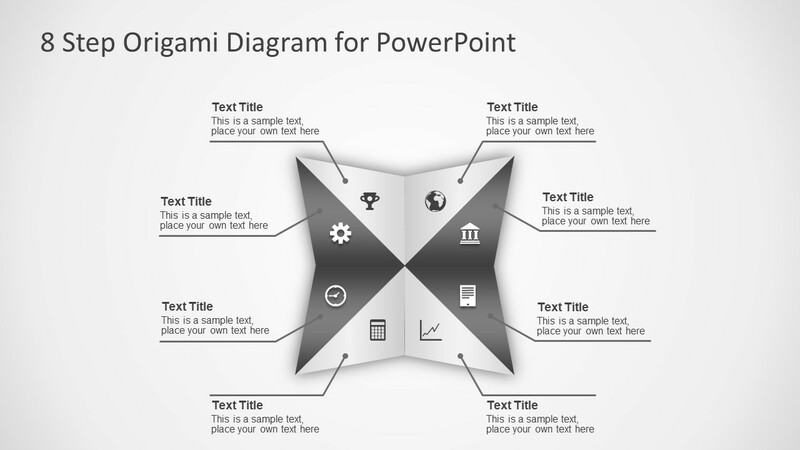 Each step of free origami diagram presentation has text placeholder to enter the valuable information with title and description. 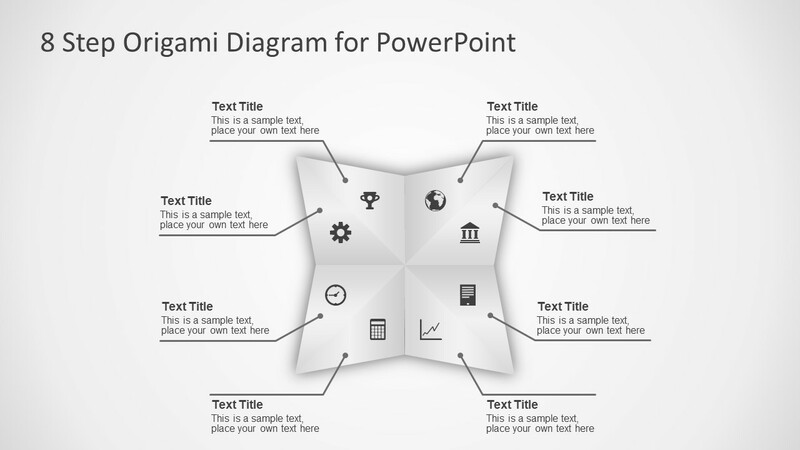 The Free 8 Step Origami Diagram for PowerPoint helps the presenter in visualizing many ideas. For instance, the creative designers, artists, and business presenters can display their concepts in style. 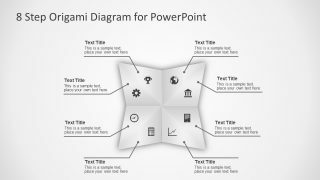 Furthermore, the infographics with represent the 8 steps graphically, are usable for displaying various terms in an origami diagram template. 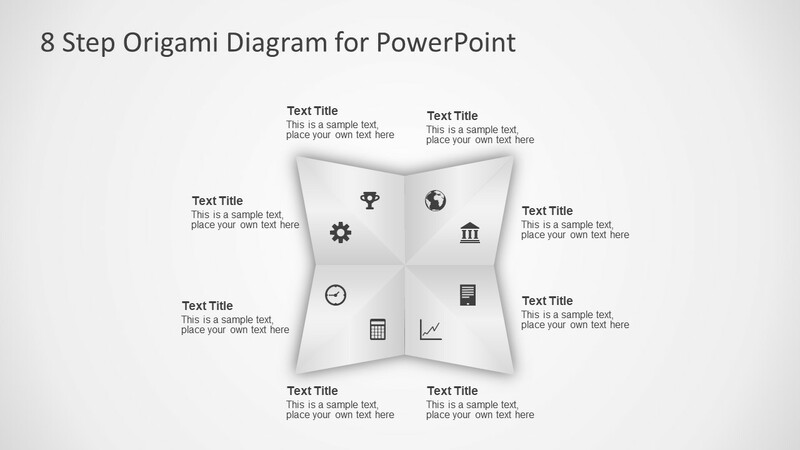 The free diagram template of PowerPoint has four slides of free origami layout versions. These slides enable users to see the several editing options available. For example, the slide with two shades of gray and the one without the line directing to the text placeholders. 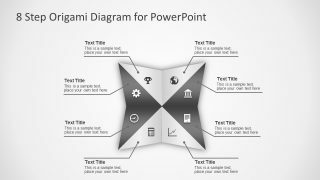 A ready-to-use free PowerPoint of origami diagram can help present 8 step process flow to categories and options. Moreover, it can assist the presenter to explain business process to the viewers in details. The small icons for every step are the flat vector infographics which are easily scalable to any size. Also, presenter can customize the infographics by altering colors. Or, add effects like 3D, reflection, shadow or glow from shape effects dropdown menu. The PowerPoint free design of 8 step origami is highly suitable for marketing and entrepreneurship presentations. The flat origami designs and icons aid in making a visual impact at a glance.